How to read the data, find what’s trending. This session will be a walk-through and showcase of some of our most recent visualizations and stories. We’ll discuss the questions we hypothesized, the data we found, and the final visualizations we released. 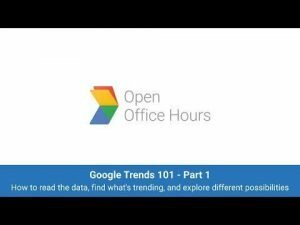 Next Steps: Learn how to incorporate Google Trends with other data tools. (June 30) This session will show how to find additional Google datasets on our GitHub. We will then dive into how to integrate Google Trends data with other open source tools, including mapping our results with Fusion Tables. Open Q&A: Join us for any additional questions on Google Trends. (July 7) This session will be one final refresher with the most important takeaways from Google Trends. It will also be open for any additional questions on any topic!